38 kms. from Rudraprayag on the Rudraprayag – Pokhri route is a village Kanak Chauri from where 3 kms. trek leads to Kartikswami. This place has a temple and idol of Lord Shiva’s son Kartikeya, situated at a elevation of 3048 mts., the place abounds in natural beauty and one can have a close and panoramic view of the Himalayan peaks. This magnificent temple dedicated to Lord Vishnu, lies in the village of Triyuginarayan, on the ancient bridle path that connects Ghuttur to Shri Kedarnath. 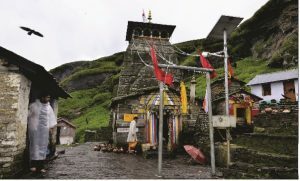 It is similar in architectural style to the temple of Kedarnath making this village an important pilgrimage centre.According to a legend, Triyuginarayan was the capital of the legendary Himvat and is the place where Shiva wedded Parvati duing the Satyug. the fire for the divine wedding was lit in the huge four cornered Havan Kund. All the sages attended the wedding of which Vishnu himself was the master of ceremonies.Remnants of that celestial fire are believed to be burning in the Havan kund even today. Pilgrim offer wood to the fire that has seen three Yug hence the name TRIYUGINARAYAN. The ashes from this fire is supposed to promote conjugal bliss .There are three other kund in this village,Rudrakund, Vishnu kund and Brahmakund. These are kund where the Gods bathed at the time of Shiva-Parvati wedding. The water in these kund flows from the Saraswati kund which is said to have sprang from Vishnu’s Navel. Women seeking children bath here, believing that it cures infertility. The temple is situated in village Kandali Patti at a distance of 14 kms. from the main town of Rudraprayag and at about 6 kms. from Tilwara.It is believed to have been constructed in the age of Adi Shankaracharya. 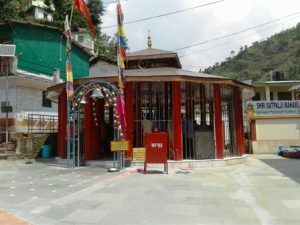 The temple has unique architecture surrounded by temple of Jalkedareshwar, Khetrapal and Jakh Devta.The origin of Indrasani Mansa Devi is described in Skandpuran, Devibhagvata and Kedarkhand. It is believed that Indrasani Devi is a Mansi Kanya of Kashyapa and is known as VAISHNAVI , SHAVI AND VISHARI. Folklore claims that the Devi cures persons who have been bitten by snake. The Shiva temple near the source of the Madmaheshwar river, is the second Kedar. 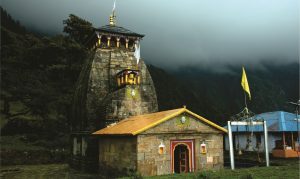 According to a legend, when lord Shiva was avoiding the Pandavas, he sank into the earth at Kedarnath with a desire to elude them and his torso surfaced here at Madmaheshwar.Located amidst serene environs, the temple has no crowd of Pandas, Pujaris, Shops or the bustle of major pilgrimage centres . 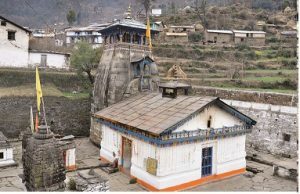 There is a small Dharamshala and provisions must be carried from the village of Gaundar.The temple is close for six month during winter when the silver idols are taken ceremonially to Ukhimath for worship. Only the Shivling remains.kali temple, Saraswati kund, chukhmba and neelkanth peak are closed to it. 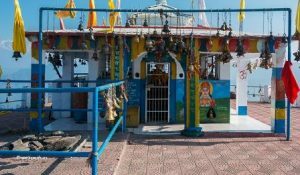 This Omkareshwar temple at Ukhimath features superbly crafted and carefully maintained icon of Lord Shiva. According to folklore, Usha, daughter of Banasur had lived here once, thus giving Ukhimath its name. In fact, Ukhimath is dotted with temples dedicated to Usha, Shiva, Parvati, Aniruddha and Mandhata, including one with the image of Mahadev with five heads – similar to the one in Kedarnath.An idol of Usha’s confidante, Chitralekha, also exists. And among the several copper plates discovered, two relate to land endowments for the Kedarnath temple made by the king of Nepal in 1797 A.D. and by the mother of an official of the court of Nepal in 1891 A.D.Nearby is the Deoria Tal, which catches the reflection of the Badrinath peak, mirroring its grandeur. As one approaches from Garurchatti, the magnificent Sri Kedarnath temple is visible on advancing barely half a kilometer. With the stunning background of towering white mountains mantled with snow, the temple presents an enchanting sight. All around it is an aura of peace and purity. Here, the unholy are said to become holy and the holy, holier still. The temple of Kedarnath is considered to be more than a thousand years old. The temple is magnificent in its style and architecture. It is built on a morainic ridge jutting out at right angles from the snowy range. The temple has a “garbha-griha” for worship and mandaps for assemblies of pilgrims and visitors. It is considered that the Pandavas felt guilty of having killed their own kith and kin after the great battle of Kurukshetra. They needed the blessing of Lord Shiva for their redemption. Lord Shiva was not willing and so eluded the Pandavas repeatedly. He took refuge at Kedarnath in the form of a Bull. Being followed by Pandavas, he dived into the ground, leaving his hump on the surface. The remaining portions of God reappeared at four other places. The arms appeared at Tungnath, the face at Rudranath, The stomach(nabhi) at Madmaheshwar and the locks with the head at Kalpeshwar. They are worshipped there as manifestations of Lord Shiva.It is one of the twelve “Jyotirlingas” of Lord Shiva. 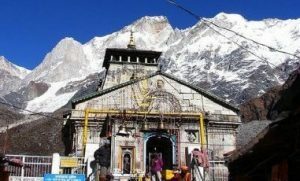 The temple of Sri Kedarnath is situated at an altitude of 3581 mts. above sea level, against the backdrop of the majestic kedarnath range. At the entrance is the statue of the “Nandi”, the divine bull. The walls inside the temple are exquisitely carved with images.Places which can be visited from here are the Bhairav temple, Samadhi of Adi Shakaracharya and Gandhi Sarovar at Chorabari Tal.Vasukital, yet another beautiful lake is situated at a distance of 8kms. from kedarnath, floating ice on crystal-clear water fascinates visitors to this lake.